Edition 3: A Devotional Prayer Journey into the Presence, Power, and Purposes of God. You can download a Word document which contains the following EDITION 3 sample bulletin announcement as well as promotional graphics (as seen below). 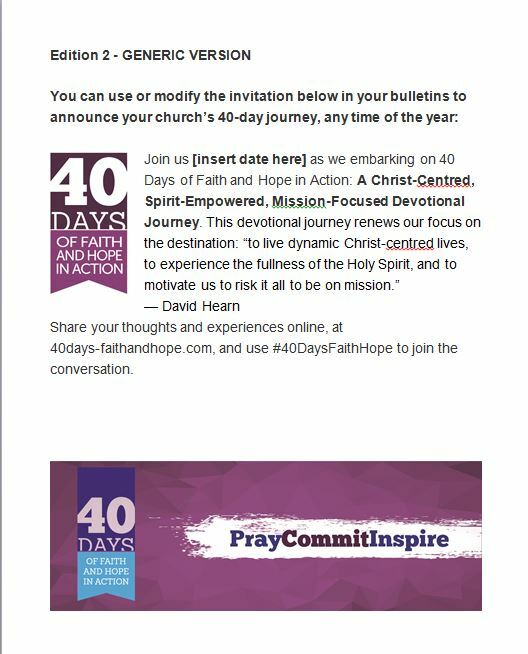 Join us [insert date here] when we embark on 40 Days of Faith and Hope in Action: A Devotional Prayer Journey into the Presence, Power, and Purposes of God. The call to prayer in this devotional journey is really an invitation into deeper intimacy with Jesus. It is through intimacy with Jesus that our authority and power are unleashed; as you pray through this devotional journey embrace your identity in Christ and expand your intimacy with Christ. Let’s be inspired together as we put faith and hope in action. You can download a Word document which contains the following EDITION 2 sample bulletin announcements as well as promotional graphics (as seen below). Edition 1: A Journey into God’s heart for Justice and Compassion. You can download a Word document which contains the following EDITION 1 sample bulletin announcements as well as promotional graphics (as seen below). Join us [insert date here] as we embark on a devotional journey into God’s heart for justice and compassion. 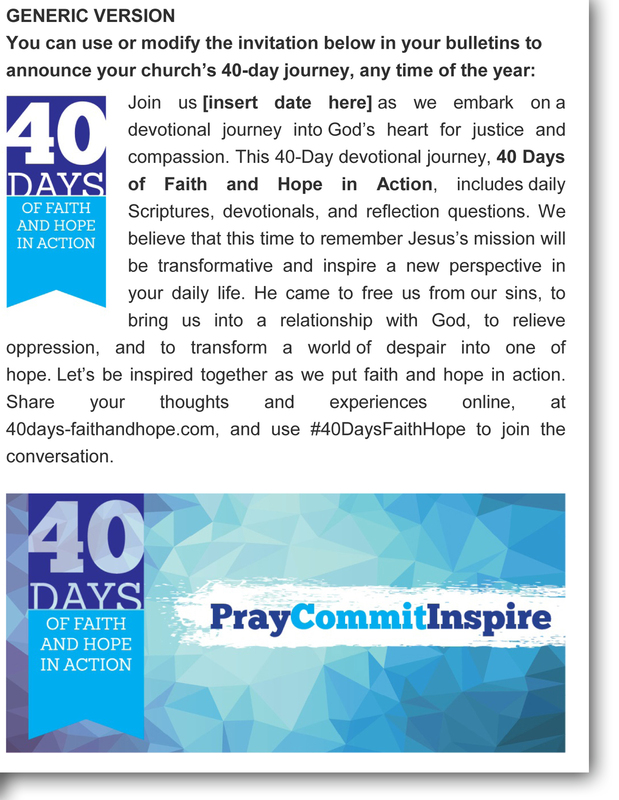 This 40 – Day devotional journey, 40 Days of Faith and Hope in Action, includes daily Scriptures, devotionals, and reflection questions. We believe that this time to remember Jesus’s mission will be transformative and inspire a new perspective in your daily life.He came to free us from our sins, to bring us into a relationship with God, to relieve oppression, and to transform a world of despair into one of hope. Let’s be inspired together as we put faith and hope in action. 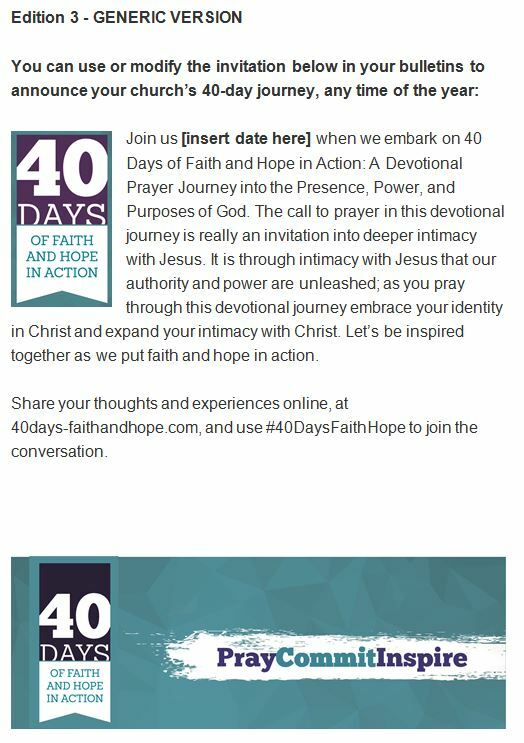 Share your thoughts and experiences online, at 40days-faithandhope.com, and use #40DaysFaithHope to join the conversation.